2016년 현대경제연구원 조사에 의하면, 한국의 GDP 대비 기부율은 0.87%에 그쳐, 기타 선진국들에 비해 떨어지는 편이라고 한다. 소위 ‘깜깜 기부’를 받는 단체들이 별다른 법적 제재 없이 기부금을 악용하다가 적발되는 사례가 언론에 보도되고, 회계의 투명성 부족은 기부 자체에 대한 불신을 자아낸다. 서울시 서초구에 있는 한국가이드스타 사무실은 겉보기에 다른 중소기업들의 풍경과 비슷해 보인다. 비밀번호가 걸린 문을 열고 들어가면 하얀 형광등으로 비친 사무실이 보인다. 직원들의 책상(5개) 위에는 각각 컴퓨터가 있고 서류들이 정리되어 있다. 주중에 돌아가며 청소하는 커피머신도 있고, 직원들은 점심시간이 되면 함께 배틀그라운드와 같은 게임을 하기도 한다. 2016년 한국보건사회연구원이 실시한 설문 조사에서 54.2%의 시민들이 기부단체를 선택할 때 기부 금액의 투명한 운영을 가장 중요한 고려 사항으로 여긴다고 했으나, 동시에 61.7%의 응답자가 기부 금액의 용처를 모른다고 대답했다. 공감대를 쉽게 유발할 수 있는 영상이나 사진 자료가 없는 가이드스타 웹사이트는 처음에 슬쩍 보면 딱딱해 보일 수도 있다. 하지만 자세히 살펴보면 단체가 제공하는 정보가 감성적 공감만큼 중요한 데이터를 선별하고, 이 데이터가 더욱 ‘똑똑한’ 기부를 결정하는 데에 큰 도움을 준다는 것을 알 수 있다. 가장 기본적인 사례 중 하나는 웹사이트에 있는 ‘NPO(공익법인) 정보 검색’ 기능이다. 가나다 순으로 단체들이 등록되어 있고, 한 단체를 클릭하면 한눈에 기본적인 회계 정보 뿐 아니라 설립 연도, 직원 수, 연락처, 미션 등을 볼 수 있다. 현재의 한국가이드스타 웹사이트는 2016년 구글 임팩트 챌린지 지원금 덕분에 완전히 새로 단장되었다. 디자인뿐 아니라 기존에 있던 ‘NPO 정보 검색’ 기능 이외에도 추가 기능들을 만들었다. 새로운 한국가이드스타 웹사이트는 업그레이드된 통계 시스템뿐 아니라 각 공익법인과 관련된 다양한 텍스트를 분석한 정성평가 자료도 제공한다. 예전에는 숫자만으로 통계와 평가 자료를 산출했다면, 이제는 ‘버즈 분석’이라는 기능을 통해 언론과 소셜미디어 등에 있는 다양한 글들을 분석해서 ‘긍정/중립/부정’으로 각 단체에 대한 의견들을 정량화한다. 이렇게 분석되는 글들은 파리가 윙윙거리는 소리를 나타내는 영어 단어를 사용해 ‘버즈’라고 부른다. 웹사이트를 새로 개발한 후 한국가이드스타의 인지도는 높아지고 있다. 2017년도 한 해 6만여 명이었던 사용자 수는 2018년도에 64% 정도 증가하여 9만 8천여 명으로 늘었다. 대부분이 신규 사용자다. 현재 웹사이트의 가입자는 약 3,500명이다. 회원 중 10%는 공익법인 및 기업이고, 90%는 개인 가입자다. 한국가이드스타가 자체적으로 분석한 후 발행하는 공익법인 평가 자료는 긍정적 평가를 받은 공익법인들에 의해 홍보용으로도 활용되고 있다. 윤 팀장은 “만점을 받은 단체들이 좀 더 쉽게 홍보할 수 있도록 배너와 인증마크도 내려 받을 수 있게 만들어놨어요.”라고 말한다. 2017년에는 전년 대비 만점 단체 수가 40% 증가했다. 그리고 국세청에 공익법인들이 제출해야 하는 외감 자료의 정보 개선도도 11% 향상되었다. 정 홍보팀장은 “저희가 구글 임팩트 챌린지와 같은 사업을 진행하고 언론 보도 자료에 개선점을 제시해서 그 수치가 올라가고 있습니다.”라고 말한다. South Korea’s rate of donation, relative to its GDP, is 0.87% and far behind other developed nations, according to a 2016 study by the Hyundai Research Institute. Organizations often use funds from donors without disclosing how they were used; on multiple occasions the media has reported on companies abusing donation funds. This widespread opaqueness in accounting increases public distrust about the very act of donating. The GuideStar office in Seoul seems like an ordinary office for a small-scale business. The space is illuminated with white fluorescent lights; on the five employees’ respective tables, there are computers and various documents. Employees rotate throughout the week to clean the coffee machine, and some play video games together at lunch, like PlayerUnknown’s Battlegrounds. According to a 2016 survey by the Korea Institute for Health and Social Affairs, 54.2% of respondents said a transparent management was an important factor when choosing a place to donate, but 61.7% answered that they didn’t know how their donations were being used. At first glance, the GuideStar website can appear dry, without the kind of videos and images that easily inspire sympathy. But look closer: The information GuideStar Korea provides is as important as those that appeal to emotion. The database helps users make wise decisions about where to donate. For example, one of the website’s most basic services is ‘Search NPO (nonprofit working in the public interest).’ The search function organizes the NPOs in alphabetical order, decked with basic accounting information, year of establishment, size of operation, contact information, and more. In 2016, GuideStar Korea was selected as a finalist for Google Impact Challenge (GIC). Thanks to the Google funding of 250 million Korean won (over $200,000), the organization was able to revamp its original website. The team didn’t just upgrade the design; additional services were added to create a more comprehensive database. During the GIC selection process in 2016, GuideStar employees went outside the office -- a rarity, laughs Yun -- to promote their organization as a finalist. They did public campaigns in downtown Seoul and even appeared on an internet broadcast hosted by Cultwo, a popular comedian duo, to appeal to the public, who would vote in the final selection process. “It was important to receive Google funding, but working altogether like this was also a valuable experience,” says Yun. Even though the team didn’t win the grand prize, the funding helped transform the old website into an upgraded ‘Wise Giving Platform,’ which launched in early 2018. One of the most important new functions is the Donorvigator, which was developed throughout 2017 using the BI tool from Qlik. The Donorvigator is an NPO statistics database, visualizing information in eight different categories including total revenue, asset value, debt status and more. 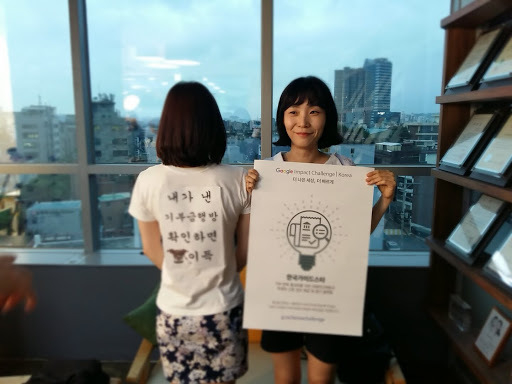 Since the launch of the Wise Giving Platform, GuideStar Korea’s reputation has improved. In 2017, there were around 60,000 website users; in 2018, this number increased by 64% to around 98,000. Most were new visitors. Currently, the website has nearly 3,500 users as registered members. 10% are NPOs and corporations; 90% are individuals. GuideStar Korea also publishes an independent assessment of NPOs. Nonprofits that received positive marks from GuideStar are increasingly using the GuideStar score to promote themselves. “We have created an online banner and certification stamp for NPOs to download and promote,” says Yun. In 2017, the number of NPOs who received a perfect score through GuideStar’s assessment system increased by 40% from the previous year. The quality of external audit information that NPOs must submit to the National Tax Pension also improved by 11%. “This number is increasing thanks to our Google-funded platform and other public campaigns in the media to improve the quality of information about NPOs,” says Jeong. Seunghee Yun goes to work every morning “in a big hurry,” usually arriving a little later than other GuideStar colleagues. To her, the GuideStar Korea office is a “place where I learn about life.” It’s where her worries about new projects, stress over unpleasant phone calls, joys at little accomplishments and all the conversations with her colleagues are condensed into one space.